The results are in from our latest online poll. 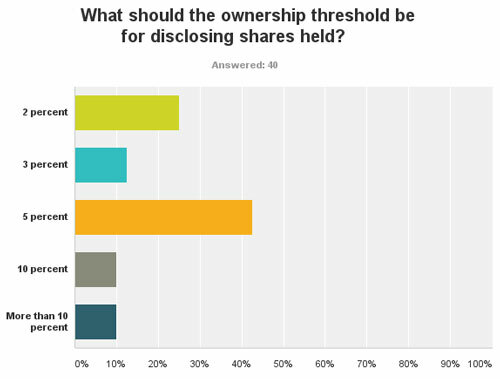 This time we asked our website readers what they thought the ownership threshold should be for disclosing shares held – and more than 42 percent back the 5 percent line seen in the US. Following this, a quarter of respondents prefer a far tighter disclosure level of 2 percent, while 12.5 percent say the 3 percent threshold, seen in a number of European markets including the UK, Spain and Germany, is appropriate. Interestingly, 10 percent say requiring investors to disclose holdings once they reach 10 percent – such as the threshold seen in Canada, for example – is preferable. This high bar has been an ongoing issue for those in the Canadian IR community, with shareholder identification difficult in the country. Issuers and CIRI have campaigned for the disclosure threshold to be halved from 10 percent to 5 percent to bring Canada in line with the US but last year the Canadian Securities Administrators decided against a cut. A further 10 percent of respondents to our poll also say a threshold of more than 10 percent would be appropriate. While the small sample size makes this poll a snapshot rather than an in-depth look at IR opinions on the issue, the key finding is in line with previous IR Magazine research, which finds that half of all IR professionals globally support disclosure at 5 percent.